The Just Review team held an inspiring event last night. 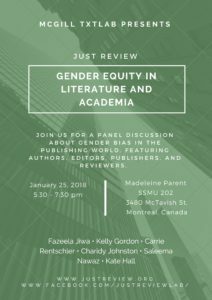 It was a roundtable of six women discussing their experiences with academic and literary publishing. It was an amazing conversation covering many different perspectives. We had two academics, one editor, one publisher, a novelist and a poet. Here are some of the themes they touched on. Putting oneself forward was a theme that kept recurring. Whether it was the confidence to send off your manuscript or speak up at a literary festival or reach out to a mentor, many of the panelists discussed how they consistently had to work against their own inner inhibitions. Based on their success as individuals you would never guess that this is something they wrestled with. But something they strongly emphasized was cultivating the confidence at an early an age as possible to take risks, speak out, and put oneself forward. Another key theme was about avoiding the myth of scarcity, by which they meant seeing gender and job competition as a competition or zero sum game. Instead, they encouraged all of us to think about how to cultivate the work of others and how, in the words of one participant, “to take up less space.” This might seem in contradiction to the first point about putting oneself out there, but it offers another way to think of literary work. Not only find your place, but do the work to make it possible for others, especially others who may have less privilege than you, to find their place. Generosity and empathy were two states of mind that were strongly emphasized. Finally, a core theme that kept emerging was the importance of creating peer-networks and “collectives.” Inevitably as a woman you will be subject to some kind of bias or discrimination in your career. These extra-institutional structures can be an important way of finding more rewarding spaces to work and create and find more open feedback loops to help improve your work. Creating these networks takes time. But the participants emphasized just how valuable such spaces have been in their lives and careers, whether it was creating independent presses, writing groups, or women-led gaming communities. Much more was discussed over the hour and a half event that I can’t cover here. But I think it was a really crucial conversation to have and one that I hope inspired the many students who were present. I know I learned an incredible amount.